There is a selection of 7 tours. Please use this tour reservation form to book a tour. Xátiva, located 70 km south of Valencia and birthplace of Borja popes Calixtus III and Alexander VI, is one of the most important historical cities in the region of Valencia. This visit includes a tour of the old town that transports us to the splendor of the city in the XV century, with its impressive architecture. It is remarkable for its noble palaces, the XV century hospital, Plaza de San Francisco, the Almodí museum, Plaza de Calixto III, the Church of Santa María, Plaza de la Trinidad, Portal de Leon, Castle of Roman origin which crowns the city and where you can see remnants of civilizations that inhabited the area. This visit can be combined with a meal at one of the typical restaurants in Xátiva. The City of Arts and Sciences is a unique complex designed by the renown Valencian architect, Santiago Calatrava, devoted to scientific and cultural dissemination which has five components: the Hemisfèric (IMAX cinema and digital projections), the Umbracle (a landscaped vantage point and car park), the Príncipe Felipe Science Museum (an innovative centre of interactive science), the Oceanográfico (the largest aquarium in Europe with over 500 marine species) and the Palau de les Arts Reina Sofía (which is the city's opera house). The Ágora, which will give the complex a multifunctional area, is under construction. The price must be reconfirmed if the number of participants is less than 25 people per service. The tour focuses on the historical center of Valencia where you visit the most important monuments: Estación del Norte, Torres de Serranos and Quart, Mercado Central, La Lonja, Plaza Redonda, Cathedral, Plaza de la Virgen and the exterior of the Basilica and Palacio de la Generalitat. The town of Manises is known for its ceramic tradition since medieval times. The well-known Lladro factory is located there. 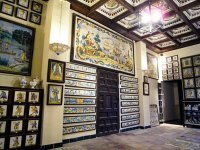 This visit includes the Museum of Ceramics, where you will see the evolution of the blue ceramics of Manises since the XV century to the present, and a ceramics factory where you will be able to see the traditional process of manufacturing ceramic products. To conclude, the tour includes visiting the typical streets of Manises where you can buy typical ceramic products. Price per person: 25 euros - This package includes: Bus, tour around historical Valencia, pottery factory tour, visit to Manises, guide, travel insurance. The Albufera Natural Park, located 11 km south of Valencia, is the largest lake in Spain and is considered a paradise for migratory birds. 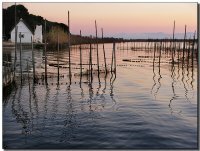 The tour includes a visit to El Palmar and a boat trip on Lake Albufera, including a fishing demonstration and bird-watching. This visit can be combined with lunch or dinner in one of the restaurants of El Palmar, well-known for its traditional Valencian cuisine. The tour includes a visit to a traditional Valencian rural house known as “barraca” and a walk through the forest to reach the Meadow Bird Observatory. Price per person: 36 euros - Package 2 includes: Bus, insurance, guide, city tour and visit the rice museum, lunch in a typical restaurant (drinks not included), a boat trip with fishing demonstration, view Barraca. The Denia that we know today is daughter of very different cultures. Iberians, Romans, Muslims and Christians that left a trail whose history we can trace; we can discover this trail through its museums, monuments and archaeological remains. The Castle is Dania's most outstanding asset. It is home to the archaeological museum. It also includes an ethnological museum and a toy museum. From the watchtowers, from the battlements of the castle, from the Tower of Guerro, at the foot of Mount Montgo, we can witness how history has evolved in this area. Discover the best kept secrets of the coast! In this tour you will visit charming places, landscapes, caves and the seabed. In this case sailing near the coast and with more stops, to see better caves and rocks. There will be several stops to see the seabed etc. (always subject to the weather conditions).